Major Calloway: It wasn’t the German gin. Arthur: Did you go out last night? Aunt Ada: Yeah, we went to Silent Fox. And, oh dear, I had so many gins I thought I’d never get home. Arthur: Well as long as you had a good time. This entry was posted in Gin and Movies, Series and tagged culture, films, gin on 2019/02/16 by Jason. Nicky: You want…gin and tonic. Shirley: Gin and tonic. That’s right. This entry was posted in Gin and Movies, Other, Series and tagged culture, films, gin on 2019/02/02 by Jason. 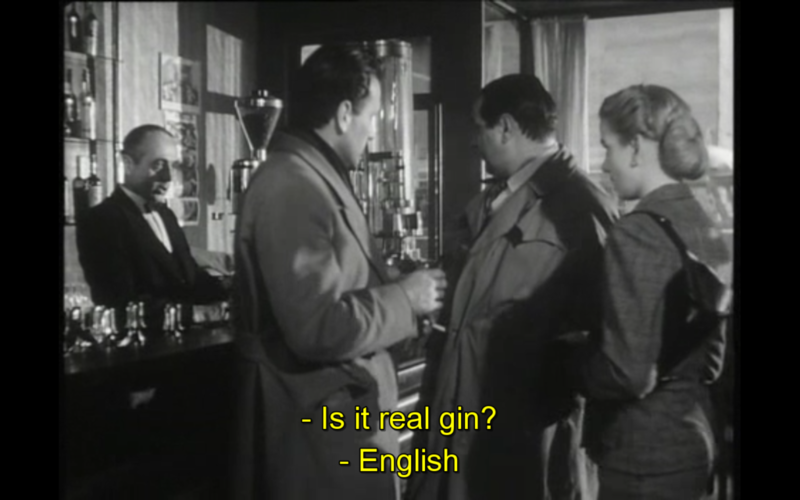 Guido’s car dealer friend: Is it real gin? This entry was posted in Gin and Movies, Series and tagged Cronaca di un Amore, culture, film, gin on 2018/08/25 by Jason.